We all know the many different functions that our teeth and gums have, however, many of us don’t know the different parts of the tooth and their functions. The exterior of the tooth consists of the crown. This is what we see when we look at teeth, the upper top part of the tooth. The crown is encased with a thin shell-like material known as enamel. Enamel is the hardest substance in the bottom, and it helps to protect our teeth from being damaged. What most people don’t realize, however, is that there is much more to the mouth and teeth! The root of our tooth is the part that is implanted into the gums. Although this part may not be exposed like the crown, it too can develop cavities and other oral issues if not taken care of properly. The outer layer of the root, known as the Cementum, binds the root to the bone and forms the socket of the tooth. So, What is the inside of the tooth made of? Inside our tooth is a material known as Dentin. Dentin is softer than enamel, however, it is more hard and durable than a typical bone. The dentin surrounds the inner tooth core, which is typically known as the pulp canal or root canal. This area is where nerve ending and blood vessels sensitive and nourish the root. Understanding teeth and how they work is extremely important, however, nothing is more important than understanding the proper and best ways for caring for your teeth. If you want to keep your natural teeth for years to come, it is important to maintain the best oral hygiene possible. What happens if I don’t take care of my teeth properly? If teeth are not treated for properly, they can develop cavities, tooth decay, and other severe oral health issues. If left untreated, these can result in the requirement that the tooth (or teeth) be extracted. This may mean needing expensive dental treatment or possibly even dentures! To keep your teeth healthy, strong, and beautiful be sure to brush twice a day, floss AT LEAST once a day, and visit your dentist in Canton, OH, twice or more throughout the year. This is the best way that you can avoid needing dentures or false teeth. Your teeth are good to you, so be good to them; keep them clean, health, and strong! Call (330) 493-8400 or click here to schedule an appointment with Dr. Guy B. Hisrich! 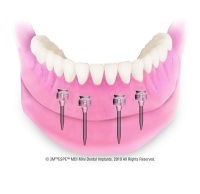 Learn More About Mini Dental Implants! Click the picture to learn more! Dr. Guy Hisrich, your dentist in Canton OH, strives to help patients achieve the smile of their dreams. Call our office today!